The Hoover Fusion Pet is a lightweight upright vacuum cleaner with a surprising amount of built-in technology. Like other modern cordless models it has a long lasting lithium ion battery that not only holds a charge much longer than prior generation batteries but also keeps the power constant. This is important because you don’t want your vacuum to slowly lose suction and cleaning ability as the charge fades, which was a big problem in the first generation cordless vacuums. The biggest reason you would buy the Hoover Fusion is its’ versatility. It was designed to clean just about any surface, with the exception of medium to high pile carpets which are better suited to full sized vacuum cleaners. But if you need to clean hard floors like tile, hardwood, laminate, or even area rugs then a fast charging cordless makes a lot of sense. The modern household has many different types of flooring which is why just about every major vacuum brand has at least one portable model in their lineup. Many of them also can transform from stick to handheld, with the ability to use several different cleaning attachments. One technological feature that really stands out on modern vacuums when compared to those of the past is a dashboard to show you any necessary information. The integrated one found on the Fusion Pet displays maintenance alerts so you can keep it operating at peak performance. You will also see the brush roll or floor mode as well as the remaining battery charge. You can quickly see how much time you have left so you can finish whatever room you are cleaning. Another big difference with the cordless vac of today is the quality of the batteries. The vast majority come with the latest lithium ion technology which last longer and provide a lot more power than prior generations. The all new Hoover ONE PWR™ is rated to provide twice as much run time as the other leading stick vacuum cleaners that are offered today. This is based on a comparison of running the Fusion in high power mode with the others in a similar capacity. This means you get high powered suction for a longer period than the competition giving you the ability to clean your whole home on fewer charges. You will definitely notice the difference if you have ever used one of the prior generation models. There are a couple of reasons why it makes a great choice for the modern household with animals living there. The first is the included Pet Tool package which has a specially designed upholstery attachment for pulling hair off any surface. A crevice tool also lets you get deep into any hidden corners where hair and dander can gather, and these tools can be used in handheld mode or with the extension wand. An odor absorbing filter helps you cut down on those telltale pet smells, leaving the air smelling much fresher than before. This model also comes with their well known Windtunnel technology which has multiple channels to lift and remove embedded dust and hair from any type of surface. The multiple cyclones inside the air pathways also reduce clogging inside the Fusion. Each cyclone is designed to remove dirt and dust particles from the air as it passes over, before it reaches the filter. The end result is no loss of power during extended use. The Fusion Pet cordless is designed to be used as a lightweight upright stick or handheld (with or without the extension wand attached). You can use any of the attachments in either mode giving you a variety of configurations for such jobs as cleaning curtains, furniture, hard floors, stairs, and even car upholstery. The handheld body quickly detaches from the main unit to give you the perfect tool for the quick pickup. And full upright mode even comes with swivel steering, allowing you to move the head around large items in your home with much less effort than full sized upright vacuums require. Quick Install Wall Mount lets you store the vacuum and attachments and even charge the battery when not in use. Extra Capacity Dirt Cup holds as much as 50% more dirt than other leading cleaners, per independent testing. Low Profile Head Design lets you operate it under power very low to the ground so you can reach under tables, beds, and some furniture items. While you won’t want to clean your high pile or thick carpets with a cordless vacuum like the Hoover Fusion Pet, it’s pretty obvious that it has its’ place in the modern household. For hard floors like tile and laminate you can quickly pick up spills or pet hair, and for those ‘above the floor’ surfaces like bedding and curtains you can break out the handheld mode for fast cleaning. 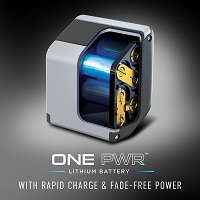 The newer generation of lithium ion batteries last much longer than before and provide more power than you would expect. Many cordless vacuums have great filtration too so you won’t have to worry about allergens making their way back into your home. As the technology improves across the industry, these lightweight machines keep getting better. 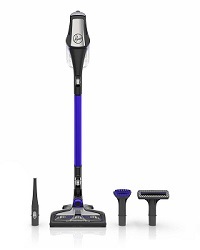 The Dyson V series, Shark Ion FLEX, and this Hoover Fusion Pet are on the forefront of this improvement in technology and overall cleaning ability. For more information about the Fusion including current pricing and online consumer reviews, click here to visit our recommended supplier.